Digital Ultraviolet and Digital Copy will makes it possible for you to stream the movie Mission Impossible Fallout iTunes 4K Code instantly to your computer and compatible Smartphones, Andriod, iphone, iPod Touch, iPad and tablets devices anytime, anywhere. 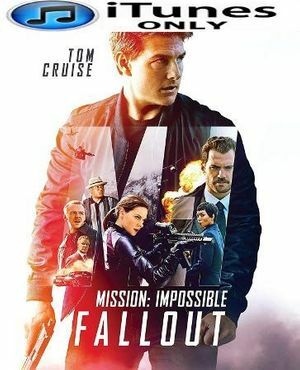 You can also download a Digital Ultraviolet Copy or a Digital Copy of the movie Mission Impossible Fallout iTunes 4K Code to your computer and compatible devices. It�s tough to believe, but Tom Cruise�s career in motion pictures is well into its fourth decade. For at least thirty-five of those years, since his breakthrough success as an enterprising high school senior in Paul Brickman�s �Risky Business,� Cruise has been a full-blown movie star, at the absolute pinnacle of success, a top gun in his business. In motion picture terms, that�s nothing short of astonishing. But there�s a big difference between being a movie star and being a serious actor. And although we sometimes have an unmistakable impression that Cruise longs to be thought of as a serious dramatic actor, it�s really his movie stardom that we keep buying tickets to see. Having never starred in a comic-book based picture, Tom Cruise is possibly the only actor on earth for whom an appearance as a superhero would be considered a step down. But Tom Cruise the Movie Star is at his absolute best in big, flashy, expensive action blockbusters�pictures like �Top Gun,� �Days of Thunder,� and �Edge of Tomorrow.� The responsibility is enormous�when a big, expensive movie fails at the box office, it fails big�and the fault is usually laid at the feet of the star. But when such a movie hits the bullseye, as Cruise�s efforts often do, the results are sometimes almost historic. Based on Bruce Geller�s legendary television spy series from the 1960s, the �Mission; Impossible� pictures feature Cruise as Ethan Hunt, an agent for the Impossible Mission Force, a fictional secret agency operating as an independent arm of the United States government. Acting on the orders of the Executive Branch of the US government, the IMF employs espionage as a means of preventing international disasters such as war, acts of terrorism, or the occasional nuclear holocaust. The �Mission: Impossible� movies often resemble an American counterpart to the British James Bond pictures, with Tom Cruise occupying more-or-less the space once never quite filled by other, lesser personalities following the departure of actor Sean Connery from the Bond series. But unlike the James Bond pictures, the plots of the �Mission: Impossible� films are secondary to the thrills, deceptions, and dramatic reverses. �Mission: Impossible� pictures seem to aim for twists and turns more preposterous than in any other spy thriller. From that perspective, the series often resembles an elaborate Las Vegas magic act, built around a desire to deceive the audience by any means possible, and then make them laugh by revealing how impossibly easy it was to trick them. That's why it remains so much fun when one character will remove a rubber mask and reveal himself to be an entirely different character�a hoary old movie trick which grows tiresome even in cartoons, but still occurs with such clocklike regularity in the �Mission: Impossible� movies that audiences often applaud the deception. In �Fallout,� still haunted by his separation from his wife at the end of �Rogue Nation,� IMF superspy Ethan Hunt botches an attempt by his team to recover a cache of stolen plutonium when he chooses the life of one of his agents over the success of the mission. Over the objections of the IMF director, before the team�s next attempt to recover the plutonium is launched the new CIA chief assigns one of her own agents to Hunt�s team to act as a watchdog�and possible assassin, should Hunt disobey orders or become disloyal to the mission. One of the strengths of the �Mission: Impossible� films is that Tom Cruise, who also acts as a producer on the series, has a producer�s sense to surround himself with the best supporting cast money can buy. In �Fallout,� returning from previous installments are actors Ving Rhames, Simon Pegg, and Rebecca Ferguson as the always-reliable members of Hunt�s IMF team, Sean Harris as an anarchist leader who acts as sort of a Moriarty to Hunt�s Holmes, Michelle Monaghan as Hunt�s estranged wife, and Alec Baldwin as the IMF chief, Hunt�s superior. Angela Bassett joins the cast of regulars as Erica Sloane, the new director of the CIA. And Henry Cavill appears as August Walker, the CIA watchdog assigned to Hunt�s IMF team. The opposite of Cavill�s other screen incarnation as the Man of Steel, Walker is an impossibly wooden and soulless killing machine. Like Robert Shaw�s Grant in the 1962 Bond picture �From Russia With Love,� there�s not a single ounce warmth or humanity in this character. He barely even has a pulse. But there�s no actor in the world who works harder than Tom Cruise to make sure the audience is entertained, particularly in the �Mission: Impossible� pictures. Whether scaling a cliff, racing a motorcycle�sort of a Tom Cruise calling card�or clinging to the outside of an airliner in flight, Cruise famously is the last of the major stars who performs his own stunts instead of allowing professional daredevils to step in. If you see the character doing it on the screen, chances are good Cruise insisted on really doing it for the actual filming. The production�s insurance premiums must be enormous. Co-produced by master showman J.J. Abrams and written and directed by Christopher McQuarrie, who also filled the writing and directing positions on 2015�s �Rogue Nation� and works with Cruise on his �Jack Reacher� pictures, �Fallout� becomes a two-and-a-half-hour symphony of vastly entertaining nonsense. Built from a script which doesn�t withstand close scrutiny, the picture is not so much a coherent narrative as a collection of action-packed, show-stopping, eye-popping, chest-grabbing set-pieces. But it all works beautifully, and after a while even seems to take on a life of its own. Accompanied by the music of composer Lorne Balfe, who builds his score around the driving and percussive brass and flute-driven strains Lalo Schifrin�s popular �Mission: Impossible Theme� from the days when the series was a television staple, audience members might find themselves viewing �Fallout� from between their fingers. In auditoriums featuring IMAX and 3D, viewers might find actually themselves more comfortable watching the picture from under their seats. Rated PG-13 for violence, suspense, and intense action sequences, �Mission: Impossible�Fallout� is highly recommended for adults and older children.